If you feel that you are having difficulties finding the right natural tick repellent, this short paragraph should be able to help you get all the information you need to make an educated purchase. After doing proper research where we’ve considered the quality, affordability, and effectiveness of some of the most popular options on our list, we’ve concluded that the model you should consider is the Wondercide Flea & Tick. It is a safe and natural alternative to chemical pesticide spot drops, powders, dips, and sprays. 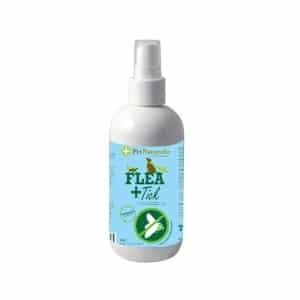 It is highly effective, and it can kill and repel fleas, mosquitoes, and ticks using only natural ingredients. It can be used safely for puppies, kittens, nursing and senior pets and apart from acting as a repellent, it will also leave the coat shiny and clean. 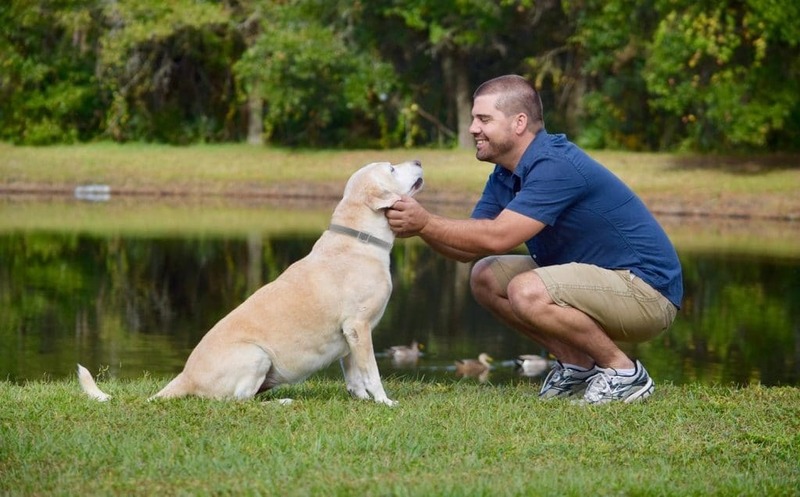 If by any unfortunate event our first pick is not available, we recommend you bear the Pet Naturals Of Vermont Protect in mind as your second alternative. The Wondercide All Natural Control is a safe and natural way to control tick and flea populations both on your pet as well as in its environment. This product will either kill or repel all sorts of nasty critters from your dog’s fur and ensure that you won’t have to fight a full-blown infestation later on. The Wondercide insect repellent spray contains the active ingredients cedar oil, sodium lauryl sulfate as well as extracts from lemongrass and castor beans. These are natural repellents that won’t keep just ticks and fleas at bay, but also other insects such as mosquitoes and flies. One of the best things about this spray is that it is natural and free of hazardous chemicals. What this means is that you can safely use it inside the home as well, as you can spray bedding, furniture as well as area rugs and carpets. This product is sold in a 4-ounce spray bottle. 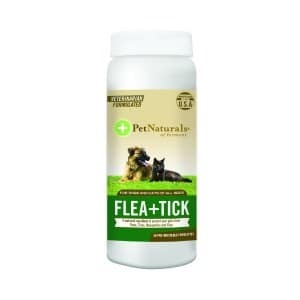 In case you’re tired of using conventional tick control treatments that can contain harmful chemicals and toxins, then you should definitely give the Pet Naturals of Vermont flea and tick spray a try. 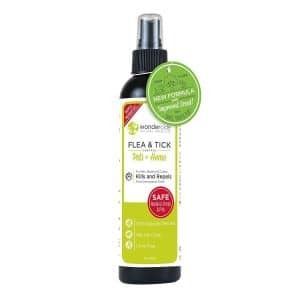 Made only from all-natural products, this spray will keep ticks and insects away from your beloved dog so that going outside or strolling in the park won’t be a problem anymore. This spray contains only natural ingredients that are known to be effective insect repellents. These are lemongrass oil, castor oil, sesame oils and cinnamon oil. They work together to make your dog unattractive towards pests so that you won’t have to fear an infestation. You can also use this spray for bedding or carpets in case you observe ticks or other pests roaming around inside the house. You might also want to complement this treatment with another product that you can use to kill both adult fleas and ticks as well as their eggs and larvae that might be living in your yard. If your dog has problems with ticks or fleas, then the Pet Naturals of Vermont wipes are an ideal solution. These are impregnated with natural ingredients-only so that you don’t have to worry about using powerful chemicals such as pyrethrins on your dog. Each product comes with 60 wipes that can be gently applied on your dog’s fur. These contain ingredients such as lemongrass and cinnamon oil which are great at repelling ticks and insects that might attempt to invade your dog’s fur. These also contain mineral oils and vitamin E which will revitalize and soothe your dog’s skin. These wipes will not stain and neither will they leave sticky fur behind. They are also very good at cleaning your dog’s coat and leaving it shiny and looking healthy. Because these wipes do not contain any harsh chemicals, they are safe and easy to handle and you can use them as often as needed on your pet. 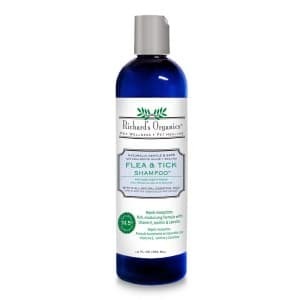 The SynergyLabs Richard’s Organics Shampoo is a great tool to help you fight fleas and ticks. This shampoo contains only natural substances and it will kill pests on your dog while also cleaning its fur. This product is perfect for dog owners who do not wish to subject their pets to strong chemicals that can be found in many conventional treatments. Containing natural extracts from peppermint, clove, and rosemary, this repellent will help keep your dog free of pests and happy to run outdoors without a worry. This organic shampoo won’t just help you control ticks and fleas, but also clean your dog’s fur of dirt and debris. With this organic solution, you get rid of ticks and also moisturize your dog’s skin and help maintain its coat in an excellent condition. This product contains 12 ounces of 100 percent natural shampoo that can be used on dogs that are at least 12 weeks old. Finding good natural tick repellents shouldn’t be too hard these days, but with so many products on the market, you can never know for sure which one is right for your beloved dog. The good news is that we’ve analyzed many products as well as natural tick repellents reviews in order to give you the very best to choose from. However, there are some factors you should always consider before getting any of the natural tick repellents for sale. If you’re one of those owners who frown upon products with lots of chemicals, some of them safer than others, you probably think that there must be some efficient tick sprays for dogs out there that don’t contain any of these conventional pesticides. If you are, then you are most certainly right. There are quite a few products such as sprays or wipes that either kill or repel ticks, fleas, and other pests, and they contain absolutely no hazardous chemicals such as permethrin or fipronil. These are safe to use and they are quite potent at keeping nasty ticks and fleas away from your dog when outdoors. Many such products contain well-known insect repellents such as cedar oil, lemongrass oil or peppermint extract. These are safe to use and they also have the benefit of making your pet smell good. With sprays, you can also treat surrounding areas both inside and outside the house so that you also kill eggs and larvae and prevent a major infestation. In case you’re looking for good tick treatments for dogs that last for a longer period of time, then getting one of the many collars from a reputable manufacturer is a great idea. These collars can be easily attached around your dog’s neck and they can provide your pet with protection against ticks and other critters for a few months. Before getting any of these collars, you should make sure that you read the manufacturer’s specifications and avoid any products that contain substances that your dog might be allergic to. When it comes to natural pest repellants, shampoos are also great choices for your pet. These can also kill adult ticks and fleas hiding in your dog’s fur and then act as repellents for a short to medium amount of time, depending on the product. 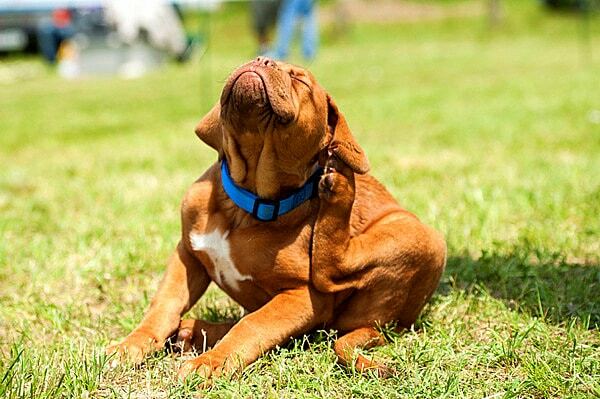 With a tick and flea shampoo, you don’t just kill pests, but also ensure that your dog’s coat stays clean and healthy.